Welcome to our Cavalier King Charles Spaniel website!! We are located 12 miles south of Mackinaw City. 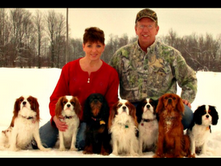 Over the years Ron and I have learned a lot about breeding the Cavalier King Charles Spaniel. We take tremendous pride in the proper care and medical testing to produce and raise healthy adults and puppies. We test the heart and eyes on our adults. We want to make sure you adopt a puppy that will give you all this breed has to offer, and will live to a healthy age. Bloodlines are chosen carefully to ensure that lines are not crossed. 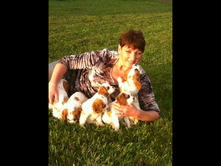 All of our cavalier puppies are veterinary approved and are AKC registered. We offer adorable, healthy, and loving Cavalier puppies in all four colors. All of our puppies are socialized and live in our home with us. Our puppies are members of our family. Our puppies, at 3 days, are given a wellness check by our Vet., dew claws removed. At 6 weeks the first of a series of shots will be given, second wellness check. We introduce the puppies to potty training. Weather permitting we are playing outside. Ron and I treat each pup as if they are our own, the pups are socialized, happy and very loved when they go to their forever homes. Being incredibly intelligent, this wonderful breed learns fast. Cavaliers would love nothing more than to be with you at all times. Ron and I have certainly enjoyed taking our babies with us as we travel. They are most gracious when meeting people. The cavaliers enjoy being outside “helping out” with yard work. We live in the country, open fields for taking longs walks. Our home is on seventeen acres, with a half acre fenced in yard for excerise, running and playtime. Then will be at your side to snuggle while you read a book or watch tv. We have been blessed to be a breeder in Michigan. We love and are loved by our wonderful Cavaliers. Experience the love of a Radle Cavalier!! 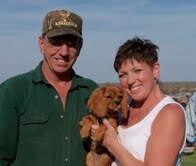 Feel free to call Ron or I to learn more, or schedule a visit to see our home, cavaliers and puppies. Wondering where our puppies are now?? Map made by Susanne Meserve- Maggie’s Mom.